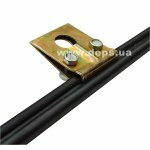 Tension clamp (anchor, wedge) PAM 06 is designed to fasten and hold stretched the cables type “8” (with suspending steel wire or cord). 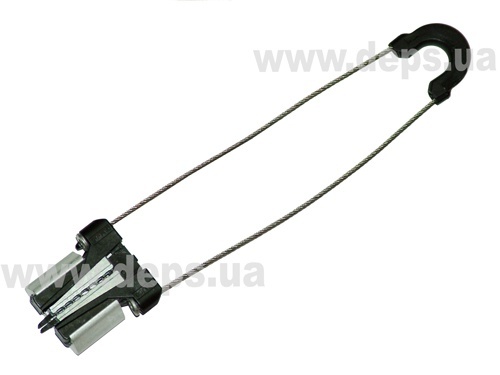 The clamp body consists of a polymer basis and auxiliary reinforcing member of aluminum alloy. 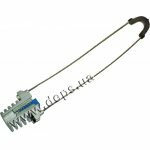 Metal clamping captive wedges ensure secure gripping of the supporting member; clip made of steel rustproof rope. High-strength polymer stabilized to the effect of ultraviolet rays ensures positive clamping under any climatic conditions. For convenient hooking by the annular fastening, the hinge can be disjoint. All the components are fastened securely and cannot be lost. 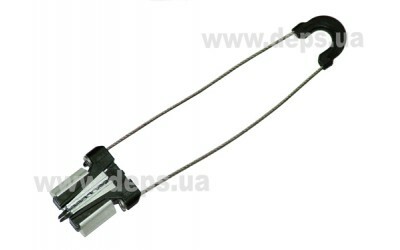 Suspension clamp Crosver SSC is designed to suspend the self-supported optical cable of “8” type on intermediate supports. 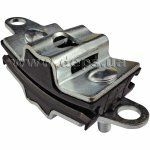 The hook is used to suspend the suspension and tension clamps on supports with no mounting holes. The hook has a corrosion-resistant coating. The hook is fastened by a bandage strap type IL. Type of cable construction: Cable type "8"
Tension clamps Crosver ASM-7 (anchor, wedge) are designed to fasten and hold stretched the cables type “8” (with suspending steel wire or cord).